After last night, it felt like we’d seen the last of the drama that this year’s NBA free-agency period had to offer. But then the Blazers went and signed Thunder center and restricted free agent Enes Kanter to a max offer sheet, which puts Oklahoma City’s front office in a position where they are sort of screwed no matter what they do. 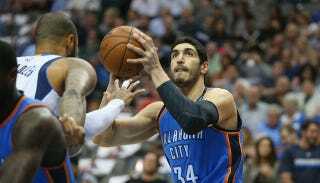 The Thunder have been negotiating a new contract with Kanter throughout the offseason, and were reportedly hoping to sign him to a deal that would pay him just under $15 million per year, just a shade below the max. But then the Blazers came swooping in, offering Kanter a four-year, $70 million max contract that the Thunder now have three days to match. The difference between a contract that pays out $15 million per year and one that is good for just over $17 million per year may not seem like much, but every dollar matters to teams like the Thunder that have to pay the luxury tax. If they trade Jones and Novak, not only does that bring the roster number down to 13, but it also puts them in the second tier of the penalty ($5,000,000 to $9,999,999). With a new tax rate of $1.75 for every dollar over in the second tier, their payment would be $8,677,312. So, to recap, by trading Jones and Novak, the organization would save something like $11,225,081. So, the Thunder can overpay a dreadful defensive center with a max contract and dump a handful of players—including their only competent backup point guard—in order to avoid paying a huge tax, or let Kanter walk and get called out for being cheap by angry fans.